So I have not picked up a Dr. Pepper lip balm in about ten years. But the other day, while killing time in CVS, I swear it was 7:30 on a weeknight and my girlfriend was seeing a Chiropractor and all the stores were closed except for CVS and Davids Tea, I had to go in. Anyway, after I got a chai at Davids Tea, I went to CVS and picked up some things I needed, nail file, Lucky Magazine, Nicorette* (Resolution #4), and thats when I came across a Lip Smaker Dr. Pepper Lip Balm and for some reason I decided to pick it up. 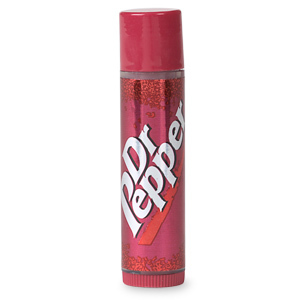 Every now and again, some person in an article about their beauty routine mentions Dr. Pepper lip balm as being their beauty staple, implying that some how this lo-fi beauty item makes you instantly cooler (it does), either way, I’m always like ‘oh yeah, thats stuff is good,’ and then I forget about it. Well, its just like you remember. It tastes and smells exactly like Dr. Pepper. In high school I kept a twelve pack of Dr. Pepper in my locker. I was an early lover of caffeine. Needless to say I love the taste and scent. But the balm is actually quite rad. Its pretty moisturizing, a little bit on the waxy side, which I happen to enjoy here. But the best part, is that it imparts this really nice but not obvious sheen on your lips and it provides that illusive wash of something I would not call color, but I wouldn’t call it not color either. You can apply this without a mirror and seem like you just don’t care (even though you totally do), but the greatest thing is that my Resolution #3 is to quit Diet Coke once and for all, so while I’m sipping on my green tea, I can slather this on and pretend its a Diet Coke.